How to Use Preset Editor. DVDVideoSoft Guide. Note: Some parameter combinations may lead to low quality of output files or conversion errors. Enjoy experimenting! 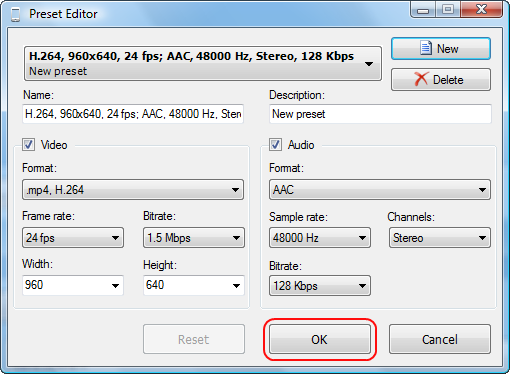 Click on the Corresponding Button in the Program to Open Preset Editor. You can change any of the existing presets or create a completely new one. If you want to modify preset, select it from the drop-down list. 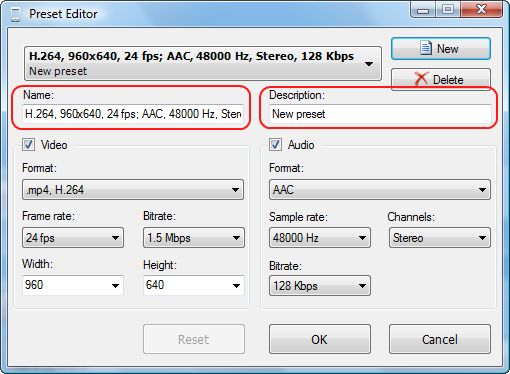 To create a new preset click on the New button. 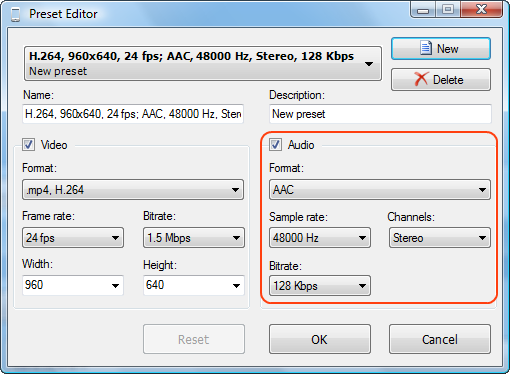 Note: All video and audio parameters that are modified immediately affect the preset name. If the preset name is changed manually (or you switch to another preset or reopen the editor), this automatic synchronization is no longer fulfilled. Put name and description of new preset in the corresponding fields or just modify the ones that are given. All applied changes are immediately displayed in combo box. 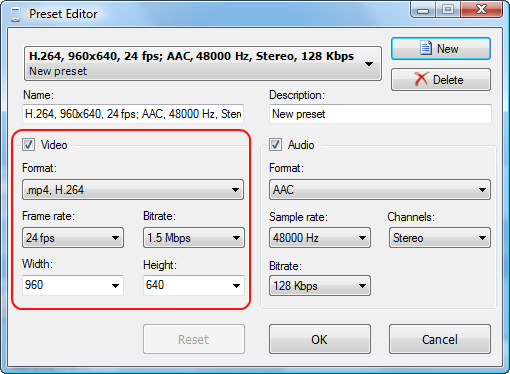 Choose the format of output video from the drop-down list. 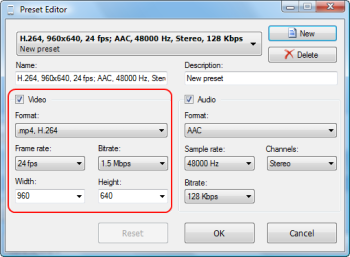 Define frame rate, bitrate, width and height of the video with the selected format. 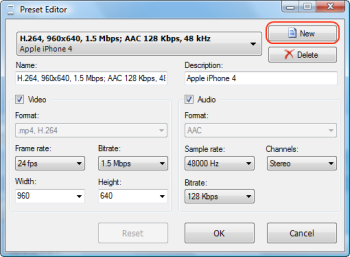 Choose the format of output audio from the drop-down list. 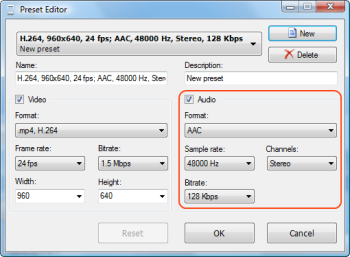 Define sample rate, channels and bitrate. Press OK to save your preset. Note: you can find your new presets in Custom quality category. 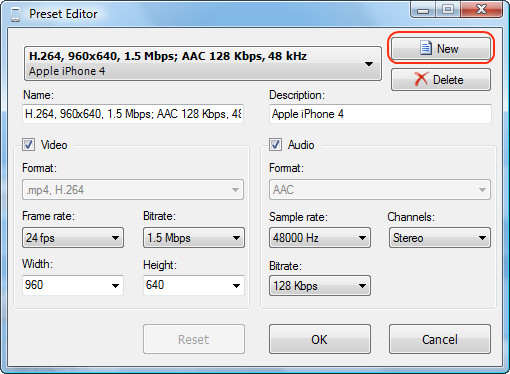 For Free Audio Converter: new preset is placed into one of the existing format categories (MP3/WMA/OGG, etc.) 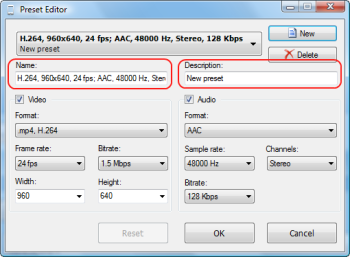 depending on the new preset format.